Arjen Robben returned to the sort of form which was regular in the 09/10 season with two well taken goals which proved the difference at Wembley. 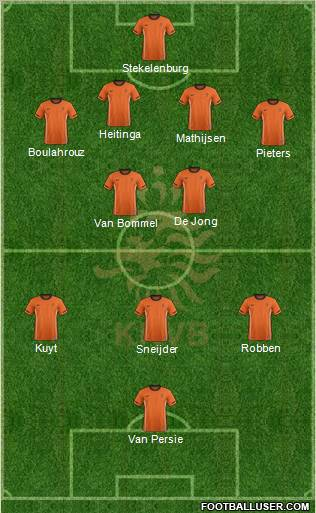 Holland adopted their usual 4-2-3-1 system which proved both expressive in attack and rigid in defence. As with the World Cup, Holland deployed two very defensively minded midfielders in Van Bommel and De Jong who rarely venture forward. This gave the front four of Kuyt, Sneijder, Van Persie and Robben especially to operate with a degree of freedom. This differs from the way in which this system is commonly deployed. The two players selected to protect the back four usually incorporate an anchor man and a deep-lying playmaker. The first has a distinctive role of breaking up play and the other is assigned to retaining possession and starting phases of play. This philosophy is common amongst most teams who use the 4-2-3-1 formation. For example, Alonso operates as the playmaker for Real Madrid and is partnered by an anchor man in either Khedira or Coentrao. Holland fail to conform to this idea, preferring to use two anchormen, taking the defensive burden away from their front four. Holland deploy 2 anchormen, allowing the front 4 creative freedom. England fans were left wondering how a game that went into the half-time break at 0-0 finished in a five goal thriller. This was a simple case of changes in personnel and a change in emphasis. England lined up with a three man midfield of newly appointed captain Scott Parker, Gareth Barry and Steven Gerrard. For the opening 45 minutes England were arguably on top, dominating possession and carving out a handful of half chances. This was because all three players were sat relatively deep. Most of the ball retention occured in their own half and in the middle of the park. The only Holland player that was operating in this territory was Wesley Sneijder, hardly a defensive work horse. England had a constant 3v1 situation in the middle of the park. Gerrard rarely ventured forward, even when he attempted to he was thwarted by Van Bommel and De Jong. It was no suprise that England’s best chances came from out wide. England's starting line up. The midfield 3 noticably all sat deep. Gerrard was substituted before the conclusion of the 1st half for Daniel Sturridge. This saw Ashley Young move into the position vacated by Gerrard. In this role, Young was more attack minded. His attempts to link up with Welbeck often led to him abandoning his defensive duties. The same problem remained apparent. Despite Young’s best efforts to cause the Dutch problems, he was still being outnumbered by Holland’s anchormen. Futhermore, this left more gaps for Holland to exploit. The game remained at 0-0 until the introduction of James Milner for Gareth Barry. This attempt to break the deadlock saw Milner join Young in the effort of getting England playing further up the pitch. Although this was a contributor to England’s 2 goals, this change in emphasis left Scott Parker and the back four very exposed. With Parker occupied by Sneijder, Robben was able to run riot. For both of his goals the full-backs were dragged out of position, the first saw Robben drive at the defence from a central position and the second saw him double up with Kuyt on the right hand side to overload Leighton Baines. England throw players forward in the 2nd half leaving Parker exposed. This game goes to show how a slight change in philosophy can have such a devestating effect. In searching for a break through, England left themsleves open to a Dutch front four which are devesating on the counter attack. England shouldn’t be too dissapointed with the outcome. Considering the transitional period they are in, this was a very significant display.